SAN JUAN, Puerto Rico — It was shortly after 4 p.m. on Jan. 30 when an employee of Bill’s Kitchen, an organization that prepares meals for Puerto Ricans with HIV/AIDS, added diesel to a large generator that is on it’s roof. “If anything happens, he is there,” said Torres. A lack of electricity is one of the multitude of problems that Bill’s Kitchen and other HIV/AIDS service providers in Puerto Rico continue to face nearly five months after Maria. People with HIV/AIDS in the days immediately after Maria were unable to receive their medications because their clinics were closed or they could not get to them because of flooding, damaged roads or a lack of transportation. Fallen trees and other debris prevented some of them from leaving their homes. San Juan Mayor Carmen Yulín Cruz told the Blade during an interview in D.C. last November that a clinic the San Juan Department of Health operates reopened two weeks after Maria and was able to distribute medication, food and water to patients. The Puerto Rico Community Network for Clinical Research (PR CoNCRA), an HIV/AIDS service organization that is based near the main campus of the University of Puerto Rico in Río Piedras, reopened a week after Maria. PR CoNCRA Executive Director Rosaura López-Fontánez told the Blade on Jan. 30 that her clients were able to receive their medications because Caridad, a Puerto Rican pharmacy chain, had a space inside the organization. Ivette González of Asamblea Permanente de Personas Infectadas y Afectadas con VIH/SIDA de Puerto Rico (APPIA), told the Blade on Feb. 3 during an interview in Old San Juan that people with HIV/AIDS who live outside of the Puerto Rican capital had a more difficult time receiving their medications after Maria. “In San Juan we had access to medications,” said González. González, who lives with HIV and advises Cruz on her administration’s response to the epidemic, told the Blade that one of the immediate challenges after Maria was getting people with HIV/AIDS back into treatment. She said APPIA worked with Merck, the Puerto Rico Department of Health’s AIDS Drug Assistance Program and the local planning council that allocates Ryan White Comprehensive AIDS Resources Emergency (CARE) Act funds to San Juan and other municipalities in Puerto Rico determine which clinics were able to operate. González told the Blade radios were the only “functioning means of communication” after Maria. González said some APPIA clients still did not have access to their medications two months after Maria. She told the Blade a lack of electricity, telephone and Internet further complicated APPIA’s ability to communicate with them. Maria also damaged many of the facilities and equipment the HIV/AIDS service organizations used. López-Fontánez told the Blade during a previous interview that PR CoNCRA “lost” more than $250,000 in equipment and medication. Several feet of water flooded the first floor of the building in which PR CoNCRA’s offices are located. Maria also damaged its sewage and electrical systems. 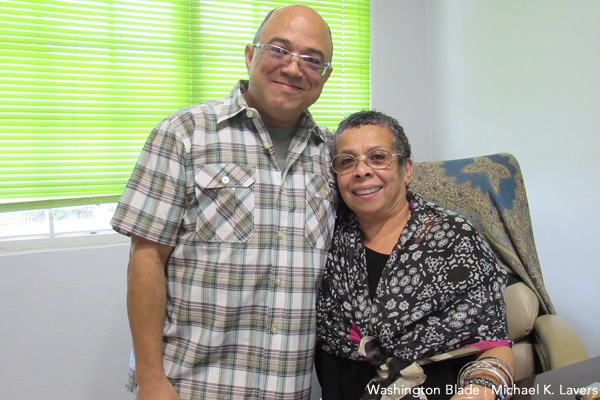 “We are still finding things,” López-Fontánez told the Blade on Jan. 30 as Anselmo Fonseca of Pacientes de Sida Pro Política Sana, a San Juan-based HIV/AIDS service organization, sat next to her in PR CoNCRA’s conference room. 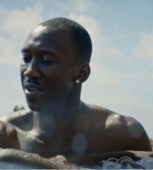 Maria destroyed Bill’s Kitchen’s switchboard. The organization did not have working landlines in its San Juan offices until late last month. Fumes from Bill’s Kitchen’s large generator forced its administrative staff to convert a second floor conference room into a makeshift office. Humidity and a lack of air conditioning made the building’s first floor offices damp. A small generator provided electricity to the first floor until it was turned off at 4:30 p.m. It powered lights, fans that staff were using in their offices and a room with Internet access that had a small air conditioner conversion unit on the wall. Maria damaged the door to AIDS Healthcare Foundation’s new clinic in the municipality of Trujillo Alto that is under construction. The inside of the facility, which will include a pharmacy and exam rooms, was undamaged. HIV/AIDS service organizations in the San Juan metropolitan area also became staging areas for relief supplies after Maria. 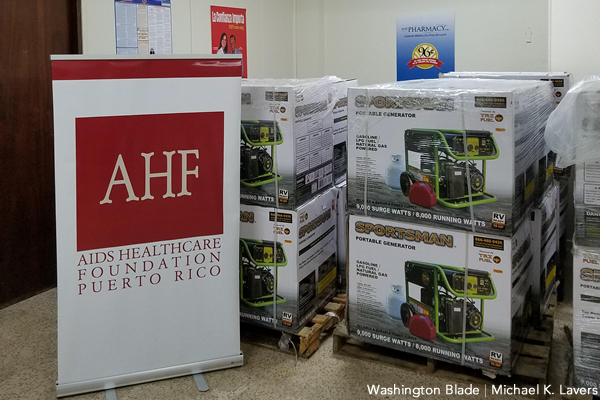 AIDS Healthcare Foundation distributed generators and packages from its existing Trujillo Alto clinic that is located on the campus of a drug rehabilitation center. It also provided drinking water and other supplies to clients and local residents. Cruz’s administration worked with AIDS Healthcare Foundation to deliver roughly 150 generators to people with HIV/AIDS after Maria. González told the Blade that APPIA, AIDS Healthcare Foundation and Cruz’s administration also provided assistance to HIV/AIDS service organizations, domestic and gender-based violence groups and children’s homes outside of San Juan. 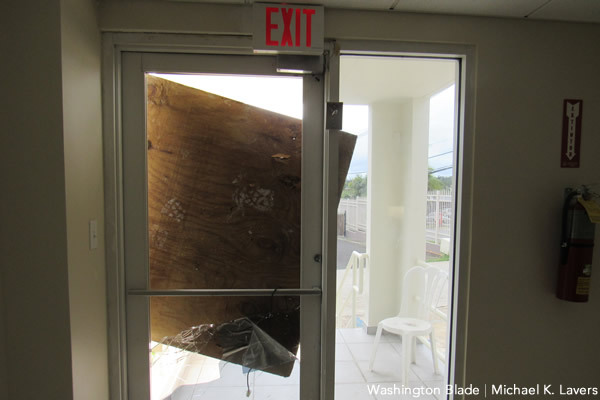 Ariel Negron, an employee at AIDS Healthcare Foundation’s Trujillo Alto clinic, noted to the Blade on Jan. 30 a woman from Caguas, a city that is roughly 20 miles south of San Juan, is among those who received supplies from the organization after Maria. Negron said the woman had not had electricity or water since Hurricane Irma brushed Puerto Rico on Sept. 7. “She was so amazed that there was water here,” said Negron. Bill’s Kitchen did not have electricity from Sept. 7 until it was restored on Jan. 31. The organization in the weeks and months after Maria prepared meals for PR CoNCRA clients and staff, doctors who were volunteering in the municipality of Toa Alta, which is roughly 15 miles southwest of San Juan, and elderly people who could not leave their apartments in high-rise buildings near their San Juan offices because of the lack of power. Bill’s Kitchen also delivered portable gas stoves to their clients and replaced mattresses and beds that Maria damaged. López-Fontánez said a woman who lives next to PR CoNCRA’s offices “lost everything” during Maria. She told the Blade she gave her an old couch that she had in her home, while another PR CoNCRA staffer brought her a mattress. 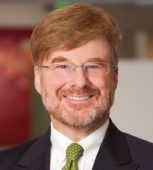 “We all gathered,” said López-Fontánez. Puerto Rico has one of the highest HIV/AIDS infection rates in the U.S. People with HIV/AIDS were vulnerable before Maria because of a combination of factors that include a lack of resources to fight the epidemic and Puerto Rico’s debt crisis. The U.S. commonwealth’s economy had been in recession for more than a decade before Maria. Puerto Rico’s power grid had also fallen into disrepair. 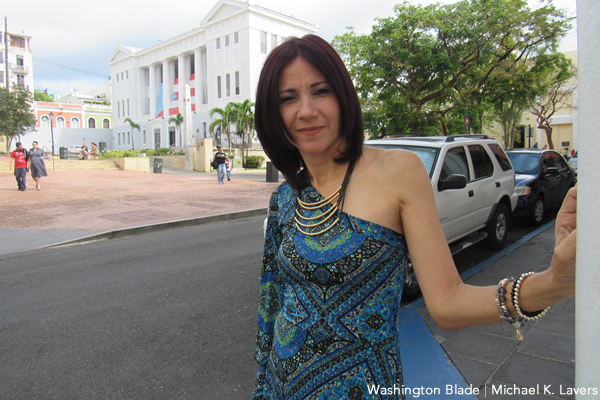 Ponce Mayor María “Mayita” Meléndez on Feb. 2 noted to the Blade that she has urged the federal government to restore Ryan White CARE Act funds her city used to provide medications and other care to people with HIV/AIDS. 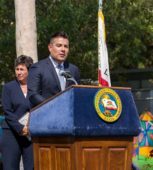 Torres and other service providers with whom the Blade spoke said Maria has made navigating local and federal bureaucracies even more challenging. Cruz and many of the HIV/AIDS service providers with whom the Blade spoke remain highly critical of how the federal and Puerto Rican governments have responded to Maria. The slow response continues to take a toll on Puerto Ricans with HIV/AIDS and those who provide services to them. PR CoNCRA Medical Director Vivian Tamayo told the Blade on Jan. 30 that an IV specialist who worked at the organization for 13 years has left. Tamayo said roughly 40 of PR CoNCRA’s clients have moved to the U.S. mainland since Maria. The Federal Emergency Management Agency denied Fonseca’s claim to fix the roof of his house near Trujillo Alto because the woman with whom he filled out the application said it was not his primary residence. López-Fontánez said the more than $120,000 in private donations that PR CoNCRA has received since Maria has allowed her organization to continue to operate. 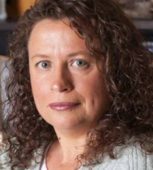 Torres told the Blade she used private funding to hire a psychologist who provides support to Bill’s Kitchen’s clients and staff. 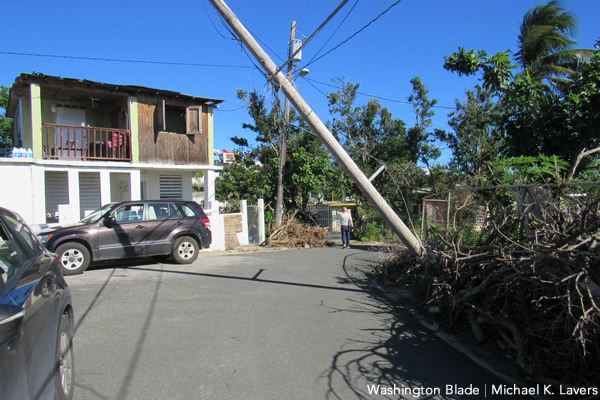 PR CoNCRA’s electricity was restored two weeks after Maria because it is near a hospital, but López-Fontánez said it “goes and comes.” She and Torres told the Blade that several of PR CoNCRA and Bill’s Kitchen’s clients and employees still have no electricity or water. González told the Blade the electricity at her home in San Juan’s Puerto Nuevo neighborhood was restored less than a month ago. 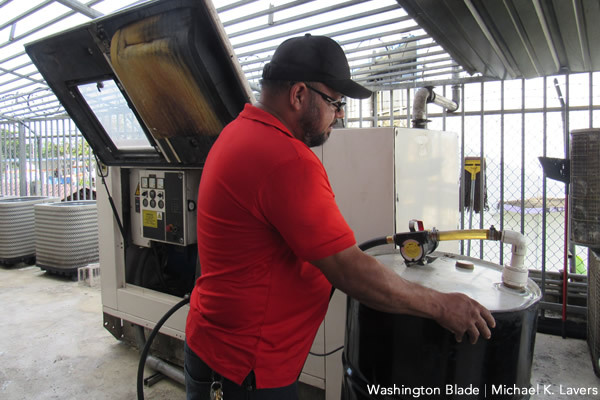 The D.C.-based Food and Friends bought Bill’s Kitchen a new generator to replace the old one. Torres told the Blade that she plans to pick up the new generator on Thursday and hopes it will be installed this week. A fire at a substation on Sunday caused a blackout that impacted Bill’s Kitchen, PR CoNCRA and large parts of the San Juan metropolitan area and northeastern Puerto Rico. Power was restored to Bill’s Kitchen and PR CoNCRA a few hours later. 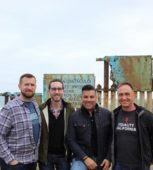 Editor’s note: Puerto Rico’s HIV/AIDS service organizations continue to seek donations that will allow them to serve their clients and repair damage they suffered during Maria. Information on how to contribute to them is below.